The Global Oak Conservation Partnership was initiated in 2015 between BGCI, FFI and The Morton Arboretum. The project’s aim is to prevent extinctions and ensure healthy populations of oak species for the future. This is accomplished by identifying and prioritizing threatened oak species and integrating tailored in situ protection and management activities in coordination with genetically diverse ex situ collections of living trees. Globally, oaks (from the genus Quercus) are of immense economic and ecological value. Oak timber and bark are used in a number of products (from whisky barrels to wine corks) and various species perform critical ecosystem functions; providing food and habitat for countless species of animals. However, many oak species are threatened with extinction and oak-dominated ecosystems are declining worldwide. Furthermore, oak acorns cannot be seed banked through conventional methods; so long term ex situ conservation of threatened oak species must be through living collections. In order to prevent extinctions and ensure healthy oak populations for the future, conservation efforts must integrate tailored in situ protection and management activities in coordination with genetically diverse ex situ collections of living trees. In response to the global threats facing oak species, The Morton Arboretum, Botanic Gardens Conservation International, and Fauna & Flora International launched the Global Oak Conservation Partnership in 2015. 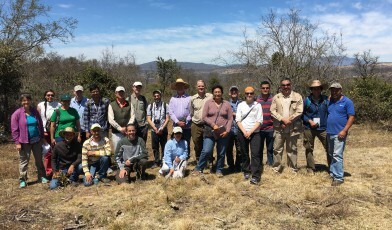 The Partnership supports oak conservation in three regional oak diversity hotspots: Mexico & Central America, the United States, and China & Southeast Asia. To identify the highest priority oak species for action. To secure wild populations of the most threatened oak species and support their recovery in situ through conservation action. To ensure Ex situ conservation collections of threatened oak species are scientifically informed, efficiently managed, genetically diverse and representative, and climate change resilient. To empower and mobilise partners, practitioners and the wider community to act for oak conservation. In 2016, the Oaks of the Americas Conservation Network was launched. Read more about this network here. For more information about the Global Oak Conservation Partnership please contact Murphy Westwood.